The Phillies returned to their winning ways last night with the 78th win of the year and Ryan Howard putting up 4 more RBI's to bring the Phillies a 11-3 victory at Citizens Bank Park. The Phils exploded with 5 runs in the 3rd inning and helped Roy Oswalt improve his season record to 5-7 with the win. Oswalt is continuing to get stronger with each start, he said in a postgame interview. Ryan Howard added his 26th home run in the 1st inning on the night and he scored Jimmy Rollins on that hit. Howard is now at 95 RBI on the year and there is still a month and a half left in the season. Ryan's highest total of RBI in a season is 149 which he hit in 2006, and then 146 in the 2008 season. Roy Halladay returns to the mound for a Sunday start and his chance at winning his 16th game of the year. Halladay is tied with Ian Kennedy of the Arizona Diamondbacks with 15 wins to lead the National League. Cole Hamels is still at 13 wins with his start on Friday night not going the way he wanted it to. Cole has said that all of the aces are in a competitive spirit to do as well as they can with each start, it looked like Cole was trying to rush his game on Friday night and that he never looked settled on the mound. 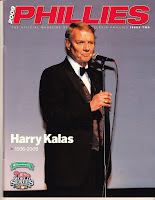 Harry Kalas, whose Hall of Fame baritone voice was silenced on April 13, 2009, touched the lives of millions of Philadelphians for nearly forty years as the play-by-play voice of the Philadelphia Phillies. Kalas, with fellow Hall of Famer Richie “Whitey” Ashburn, formed what is arguably the greatest announcing team in the history of baseball. While Harry’s colorful delivery expressed his love of baseball, his call of a game became a pure expression of love for the city and fans of Philadelphia. And, as much as Harry loved the people of Philadelphia, they remain wild about Harry. In a heartfelt demonstration of that affection, a group of Kalas admirers has kicked off a plan to fund and build a permanent monument to the beloved broadcaster. The day after Kalas died, Philadelphia Phillies fan, Antonio Jose started a petition on Facebook seeking support for a statue to be erected in Kalas’ honor and memory. One of the Facebook members that signed the petition was Philadelphia native and acclaimed sculptor, Lawrence J. Nowlan. Nowlan, a Philadelphia native with a studio in Windsor, Vermont, is one of finest figurative bronze sculptors working today and is often on the short list for commissioned memorial sculptures. Most recently the artist created a heroically sized action scene of Nile Kinnick for the University of Iowa, a larger than life Ralph Cramden installed in New York City’s Port Authority and a series of intricately detailed bas-relief sculptures commemorating winemakers at the Culinary Institute of America’s Vintners Hall of Fame. Nowlan had started sketching and sculpting Kalas over the summer and seeing the groundswell of support demonstrated on the Facebook page, inspired him to reach out to Jose. After explaining his background and vision of a Kalas monument to Jose, the originator of the petition invited Nowlan to share administration of the Facebook page. Next, Nowlan gathered a group of friends to strategize a way to turn this dream into a reality. The goals– raise the money, sculpt the memorial and deliver the finished sculpture to the Philadelphia Phillies. 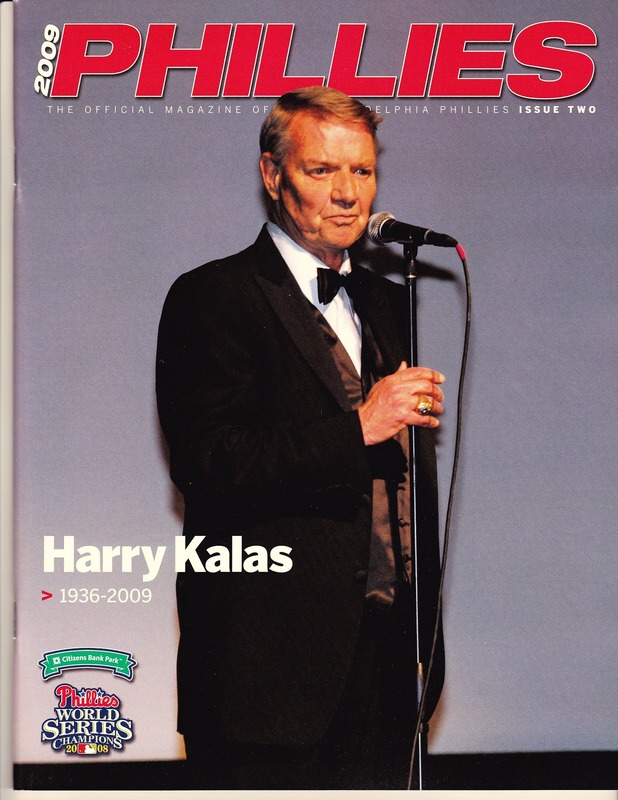 Today is the day when the statue will be unveiled for all to see, it's gonna remind us of Harry and how much he is missed by Phillies fans, players, and his friends on the broadcast crew that do the game every day and night. Rain is in the forecast for Sunday afternoon, but this event will be covered live on the Phillies pregame show on "Behind The Pinstripes" on WPHL 17 before the game so tune in if you're not going to the park today.